The plan was detailed by Andrea Leadsom, the Conservatives’ leader of the Commons [Image: PA]. What do you do if you’re a Tory MP whose party has flung away its Parliamentary majority in a vanity election? Hold another poll, to try to get your majority back? NO! You try to nullify the will of the people by corruptly stuffing Parliamentary committees with your fellow Tories! That is what Andrea Leadsom is proposing. She – together with her boss, Theresa May – knows that the other parties in Parliament would never tolerate the huge injustices that they intend to perpetrate on working people and the poor, while continuing to grab power and wealth for people who don’t need it (their own supporters and donors – but only those who are very rich). So they intend to force Parliament to accept more Conservative MPs on Parliamentary committees than the election result justifies. Presumably they are hoping they can rely on their far-right Northern Irish allies the DUP to force the vote through, even though it is an affront to democracy and a slap in the face for every single voter in the UK. Like it or not, the people have spoken and we have a hung Parliament. In that situation, the party governing by minority rule must accept that, if it wants to get any legislation passed, it must persuade the other parties to support it. The resulting laws would tend to be more balanced than in Parliaments with outright majorities for any party. By trying to bypass that situation, the Tories are saying they wish to impose dictatorship on the people of the UK. They’re saying our vote didn’t matter; they will grab power for themselves and use it to enrich themselves. The rest of us can go to Hell. And it seems we must rely on the DUP to save us from this fate. If the Tories get their way, I think we should have a general strike. Labour and the Liberal Democrats have accused ministers of seeking to subvert democracy by proposing a rule change that would guarantee the government a majority on crucial committees that scrutinise legislation. Jeremy Corbyn said the proposal, published on Friday and to be voted on next week, amounted to an “unprecedented power grab” by the government. 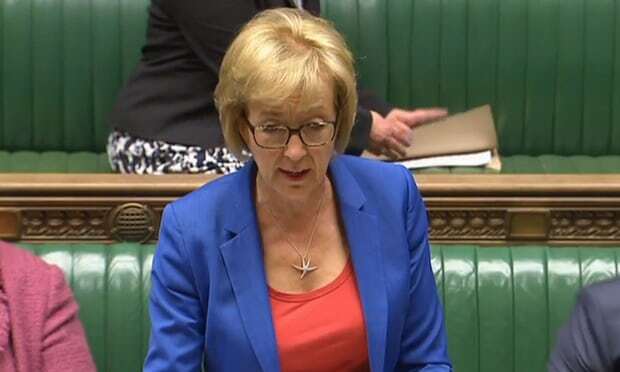 The plan, detailed in a motion by Andrea Leadsom, the leader of the House of Commons, seeks to change the rules on membership of public bill committees, often referred to by their former name, standing committees. As part of the progress of a bill through the Commons, a committee is set up to scrutinise it in detail. This is often the period when the most amendments are made and potential problems addressed. The party makeup of such committees is based on the composition of the Commons, meaning that since the election in June, when Theresa May lost her majority, newly formed committees would seek a political balance. However, Leadsom’s motion, to be considered on Tuesday, says that while parity should be sought on other types of committee, this would not happen on public bill committees. The rules should be interpreted, it reads, such that “where a committee has an odd number of members the government shall have a majority, and where a committee has an even number of members the number of government and opposition members shall be equal; but this instruction shall not apply to the nomination of any public bill committee”. Wow…..such well hidden transparancy must be a Cons cunning plan to ensure everything goes to their covert plans. Not the sort of Government I had voted for and a few million others. I guess this is what one gets when you let the Hoorays loose with democracy. This stinks of desperation by desperate despots. This is typical of today’s Tory government. A government which only play by the rules when they suit them. Unless we are happy to be dominated by a party with a desperate desire to further their own interests at the expense of decency and principle by cheating on the results of the general election we must be ready to stand up to them and if the only way of controlling their greed is by a GENERAL STRIKE then, regrettably, we have no other option but to remove them by such action. Well there is one Bill a private members Bill the interference with Prison telegraphy Bill, which is being overseen by one of these committees a very important Billto be passed as quickly as possible, I’m sure you would agree, but it still has to pass the house of Lords and House of commons scrutiny. As with the select committees the idea is to iron out many apparent problems before the main debate. it is a little underhand to claim they hand any more power to any specific party whichever one is in power because they are designed to continue with the old set up whereby the government has a built in majority. I seem to remember when our Queen ascened thr throne that there was a great outpouring of hope for a second Elizabethen age. Sorry guys, The current government has destroyed any chance of that and is busy turning us in to serfs again. Practice tugging your forelock! This might be a weak, nasty and unintelligent government, but my word, it’s a dangerous one. I’d rather see this government kicked out in a military coup. This sort of thing is very effective in other parts of the world. But then they have armed forces who get off their backsides and do summat about it. Leadsom, Fox, Davis, Duncan-Smith, the pathetic specimen Johnson, are all extremely dishonest and corrupt people. They are unfit for any kind of office or even posts as office cleaners. How about actually recruiting the best members with the most knowledge and understanding of the subject matter rather than having equal numbers of politicians. No, committee membership must be proportional to the number of seats each party gained in Parliament. As for knowledge and understanding of the subject matter – that’s a little unlikely in UK politics I’m afraid.